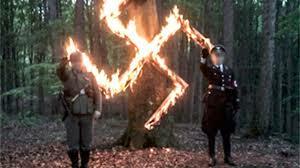 Sierra Sentinel News- Serving The Sierra Nevada Communities: Nazi's upset about Nazi firebug?? Sierra Sentinel will continue to call out harmful creeps!! Other Nazi's should be upset about their fellow Nazis being named as a possible firebugs, although for different reasons than they believe. Don't all Nazi's love FIRES??? The Sierra Sentinel will continue to call out Nazi's, gun thugs, FIREBUGS, dirty cops, and violent racists that may be harming our wonderful county. You Nazi's who don't like it, should LEAVE--move to Texas, where you may be welcome by your own type. You go get those Nazis and kkk nuts, sentinel. hooray! No one else would complain except stinkin Nazis themselves.